If the starter motor runs and the engine only starts to turn after letting the starter motor sun for a few seconds - it is definitely the starter clutch. A quick, cheap temporary fix would to be change the oil and fill it with 5w30 - the lower viscosity oil will let the one way clutch 'bite' through the oil film easier. Old dirty oil only exacerbates the problem. ok so i should probably still replace the starter clutch? 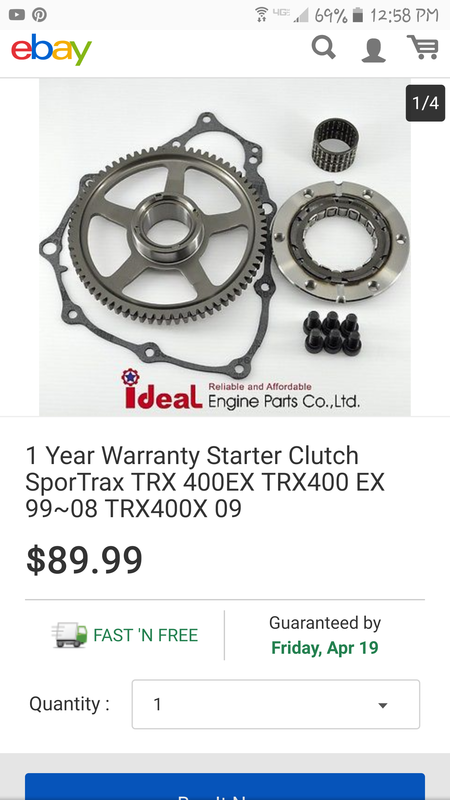 and also is the starter clutch pretty hard to access? 5w-30 wont hurt the motor in any way will it? The starter clutch is on the back side of the flywheel - need a special puller to get it off - a jaw puller will damage the flywheel - the starter clutch can be purchased with these two part numbers; 28110-HN1-A70	gear (72t) 128.85 & HO28125-HN1-003 clutch outer $161.80 - you might want to replace the 6 allen bolts that hold it to the flywheel; 96700-08016-10	bolt, socket (8X16) $1.20 ea and you will need the gasket, oil and an oil filter. so should this kit fix it?